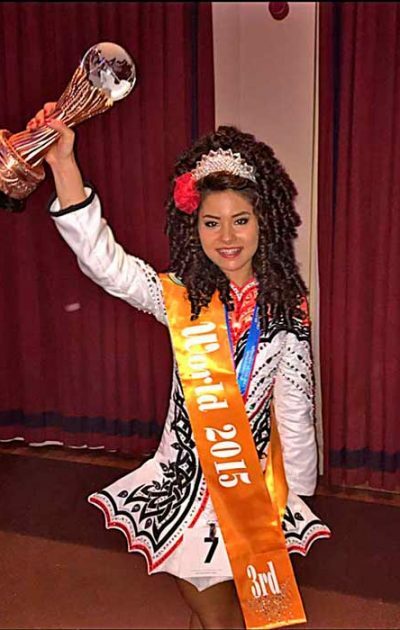 This is Hannah O’ Sullivan from Rush, Co. Dublin who won the Ladies U/19 World Championship in April of this year. We are very proud at Boyne Walk to be associated with Hannah through our Sponsorship Programme. As part of this programme we would like to feature the dancers and share with you their journey in Irish dancing. 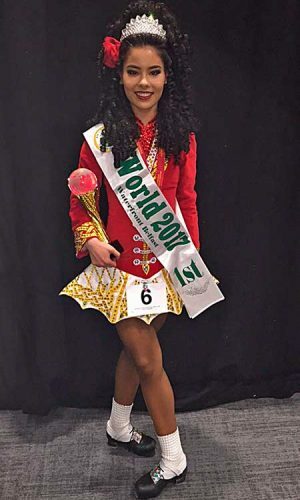 My Irish dance journey started when my mother went to see a showing of Riverdance with my father when it came to Japan, and she instantly fell in love with it. It moved her to tears. She said she knew in that moment that she wanted me to take up Irish dancing when I was old enough. I began dancing at the age of 3, and now here I am- 16 years later! I started out dancing with a local dance school in my area. I loved it from the very start- I suspect the bouncy reel music on loop and the energy of the dancing itself really appealed to hyper 3 year old me. My mother never expected Irish dancing to be anything more than a light-hearted hobby for me; something that would tire me out so I’d sleep at night instead of jumping up and down on the bed. Despite this, as time went on it became obvious to her and my teachers at the time that not only did I enjoy dancing, but I was good at it too. My teachers suggested to her that I enter the annual class feis that was coming up. 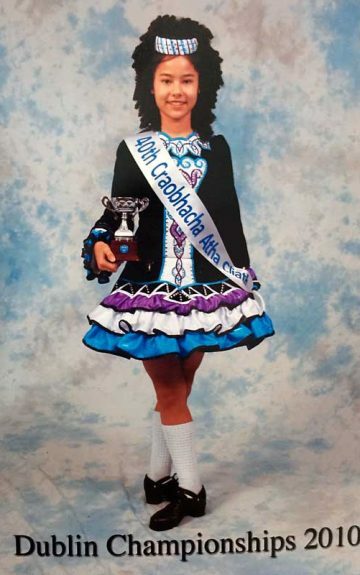 My mother was a stranger to the dance world and was utterly clueless about the competition scene, let alone what on earth a ‘feis’ was. However, she decided to go along with it and enter me anyway. 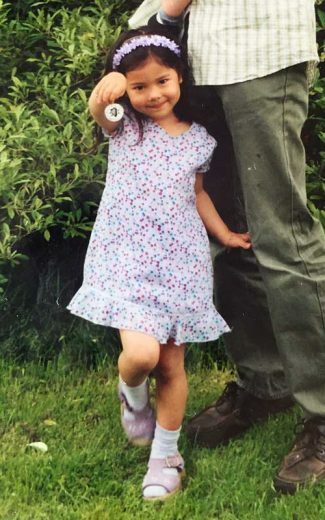 I was 4, and wore a lilac purple flower hairband with a skirt to match. Although I cried and ran off the stage when the opening 8 bars of a Beginner’s reel played, I managed to win a medal and was happy out! Slowly but surely, my mother got pulled into the crazy world of dance and I began attending feiseanna at age 6. I progressed quite quickly through my A, B, C and Pre-Open grades and was in Open Championship by the age of 10. 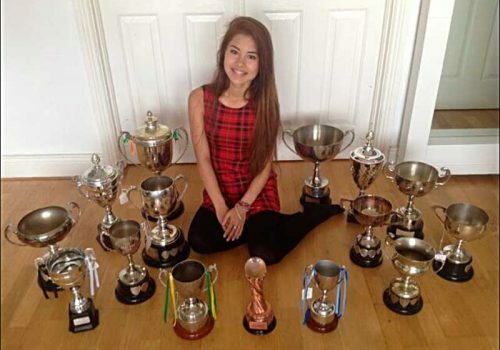 It was when I entered Open level that I truly realised how competitive Irish dancing was. I had become accustomed to coming home from feiseanna with multiple trophies, and suddenly I found myself struggling to place. It was disheartening and confusing to me, as I was still so young and I struggled to understand that I really had to put the work in if I wanted to get to the top. This pattern of no practice and bad results continued for 4 years, until I reached a point where I confided in my parents that I no longer wanted to dance. My mother urged me to think about it long and hard. When I pushed my feelings of hurt and frustration aside, I realised that despite underwhelming results, my love for dance remained unchanged. I decided to take a leap of faith and transfer schools to the Sherry Murphy Academy. I told myself that I was going to work hard to become the dancer I wanted to be. So began my journey with my 3 teachers Linda, Lynn and Katie. I can honestly say that moving to Sherry Murphy was the best decision I have ever made. In the past 5 years, they have helped me go from strength to strength and have given me unconditional support, belief and love. With them I learned how important it was to be passionate about what you do. They and all the other incredible dancers in the class really inspired me to work hard, and I found myself spending hours upon hours in front of the mirrors perfecting and polishing my steps. Practicing was no longer a chore to me but something I loved and wanted to do. It was in those hours, in amongst the sweat, blisters and steamed up mirrors that I found myself. By the time it came to competing again under a new school, my mindset was completely different to when I had done my last competition as an U/14. I was confident in both myself and my abilities, and no longer felt scared. My first major competition back was the Leinster Championships in 2013. I danced my heart out, with no real expectations, and just enjoyed my time back up on the stage. To my surprise, I placed 2nd in the U/15 competition- my first time ever placing on the box at this regional championship! There were many tears of disbelief and elation. In April of the following year, I placed 3rd in the U/16 World Championships 2014. This also was my first time ever placing on the box at the World. I remember my name being called out in 3rd and just bursting into tears. I was so overwhelmed and overjoyed! It was then that I realised what I was truly capable of, with the right people around me and the right frame of mind. I continued on to place 2nd in the Leinster Championships for 2 more years in 2014 and 2015, and placed 3rd and 2nd at the World Championships in 2015 and 2016 respectively. The competition season of 2016-2017, I had my goals set in sight and knew what I had to do to achieve them. I powered on and worked hard, and my teachers pushed me to keep bettering myself. With each passing competition I grew stronger and better as a dancer and a person. I was unwavering in my work ethic and had a belief in myself that was bigger than any result or setback. I went on to become the U/18 Leinster Champion in 2016, and was crowned the U/19 World Champion 2017 in April. The feeling of finally reaching two of my greatest dreams was like no other. To finally see my hard work over the years pay off was indescribable. Of course, to see Linda, Lynn and Katie walk out onto the stage as I stood on the top box is a special memory that I will always cherish. Going back to that period of competition where I was degressing, although it was tough for me at the time, I am so glad that I had that experience. It humbles me when I remind myself of where I started and makes me feel very grateful. I have experienced both being at the very bottom of my age group and also being at the very top, and I’m proof that it is possible to work your way up, with sheer hard work and determination. When I think back to the dancer I was a few years ago compared to now, it overwhelms me. The difference is crazy! I have transformed not only in my dancing but hugely as a person. The dedication and drive I have for my dancing extends into other areas of my life and has given me invaluable confidence in myself. I owe so much to my parents and teachers for their continued support, understanding and patience. For the moment, I am still continuing to compete. In the future I would love to tour with a show and eventually get my TCRG, and pass my passion for dance onto the next generation.